The FastPitch™ Air - Tents can easily be inflated, pitched and dismantled in minutes thanks to a revolutionary new Coleman technology. Expertly designed to maximize living space and head height, the Coleman FastPitch™ Air - Tent is effortless to pitch and will be up in minutes. Whether you’re heading for a weekend away with the family or going to a festival with a group of friends, this new construction ensures you can rapidly pitch a spacious tent with full head height, generous living quarters and amazing Blackout Bedroom™ with incredible ease. 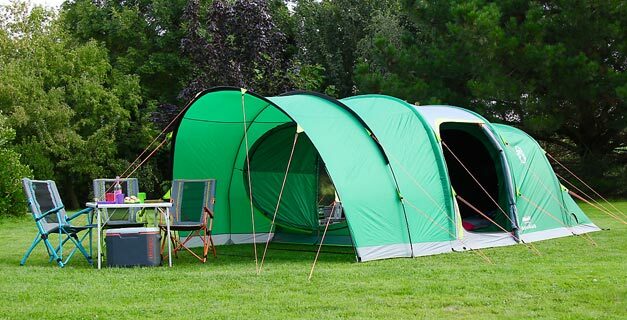 Thanks to tents' pre-attached hub with pre-attached inner tent and fast fit feet it's quick & easy to pitch – can be done by 1 person. Keep your bedroom up to 5°C cooler during the day and up to 1°C warmer during the night ** Coleman® patented BlackOut Bedroom® helps you to manage the temperature in your bedroom by storing energy from the sun in the surface of the fabric. A fabric's waterproof properties are measured using a rating called its hydrostatic head. If a tent has a hydrostatic head of 3000mm it means that a 3 metre column of water can be placed on its surface before any drops will show through the underside of the fabric. (The Ministry of Defence in the UK classifies fabric with a hydrostatic head of 800mm+ as waterproof).